When NASA's New Horizons spacecraft made its closest approach to Jupiter on February 28, 2007, the Chandra X-ray Observatory was watching the giant planet. This flyby gave scientists an opportunity to study Jupiter using the instruments that New Horizons will eventually use to observe Pluto. But it also allowed astronomers to synchronize these data with from an armada of both space- and ground-based telescopes, including Chandra. Chandra's involvement in studying Jupiter may be surprising for those who can't imagine that X-rays could come from a planet. And, for good reason too. X-rays are a kind of light associated with some of the hottest things in the Universe, such as neutron stars, supernova remnants and black holes. Planets in our Solar System are typically very cold. Even Mercury, the closest planet to our Sun, only gets to around a few hundred degrees Celsius. While that is certainly hotter than we would find comfortable, it is much less than the millions of degrees necessary to generate X-rays. Since Jupiter and Saturn are much colder than Mercury or the Earth, what chance do astronomers have of detecting X-rays from them? The answer turns out to be: a very good one. Chandra observations of Saturn show that Saturn's atmosphere acts like a massive fuzzy mirror. Saturn reflects X-rays emitted by the Sun back to the Earth, just as it reflects sunlight back to us that we see in the night sky. Astronomers were able to gather evidence for this when they saw the Sun flare on January 20, 2004, getting hundreds of times brighter. Luckily, Chandra was observing Saturn during this flare. Two hours and 14 minutes later, exactly the amount of time it takes light to go to Saturn and back to Earth, astronomers saw Saturn get brighter in X-rays. Discovering that Saturn can act as an X-ray mirror could help scientists know when the far side of the Sun flares. This could help future astronauts traveling deep in the solar system who would be affected by the radiation these flares produce. Astronomers were also able to use Chandra in a different way to study Saturn's moon, Titan. On January 5, 2003, a rare alignment caused Titan to cross in front of the Crab Nebula, which is a very strong X-ray source. Because the Crab pulsar and the surrounding areas are so bright in X-rays, this effectively provided scientists with a "medical" X-ray of Titan. In other words, Titan was illuminated from the back, just as a strong X-ray beam is placed behind a broken bone in the doctor's office. The X-ray shadow cast by Titan allowed astronomers to make the first X-ray measurement of the extent of its atmosphere, revealing that it is thicker than previously thought. Titan is Saturn's largest moon and the only moon in the Solar System with a thick atmosphere. the Sun or Io. Therefore, there's some new astrophysics to be learned before the answer is known. 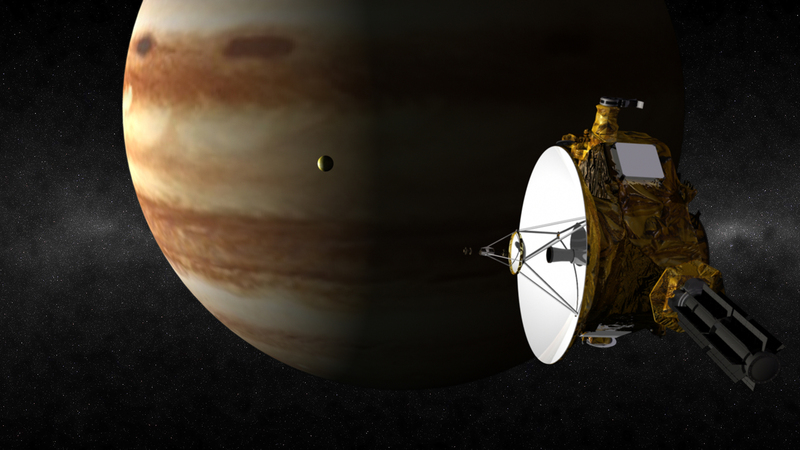 Scientists hope that the New Horizons flyby will help. Combining the New Horizons data with the simultaneous Chandra observations of the whole planet's magnetic field, astronomers may find new insight into this complicated planetary system. While spacecraft have been sent out to study the outer Solar System, certain secrets may only be revealed through the X-rays that Chandra can detect. Scientists will continue to use the observatory to unlock the mysteries of our planetary neighbors.